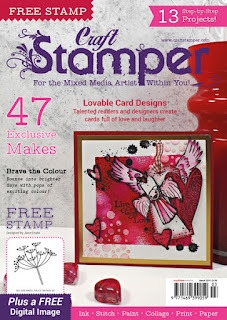 Happy to tell I`m in the March Issue of Craft Stamper !! I'm really excited to say that I have a project in the March issue of Craft Stamper magazine, as a part of That`s Crafty DT group . It will be in the shops on Friday this week . and below the front of the magaxine. this Monday . Yes again one of my loved nature panels. one of the other teamies . I hope to be back with a new Sneaky Peek, Monday 12`th . Take care, and have a lovely week, all. Tuesday Party again, with two of my Neutral made hearts. blogging community, and also among so many of my FB friends. beautiful Simply Neutral , blogposts to watch over there. Yes ,-our new system, on the That`s Crafty Challenge blog starts this months. The idea is to create two separate creations, but mainly using the same products . I cheated a bit, as I uses a few other products than on my "My delicate wings " first piece. I used one of the new paints , Bright Blue , mixed with a bit of white, on the panel, and letting it dry .Then the lovely stencil , Mandala was used together with the Metallic Ice Blue ,paint, dabbed through it, twice , -drying in between each layer. text stamp on the background, and furthermore ,before stamping it directly, I adhered a piece of tea dyed tissue paper. and black Posca pen, Silver threads were adhered to the flower, and a part of one of Lynne`s Affirmations stamped onto a rest of the dyes tissue. Multi Purpose Craft Adhesive . That`s it for my second Challenge Creation this months. I hope to see some of your creations, there. Old lace, reused silver thread , tissue paper , black Posca pen. YES it is here !!!! You can see the whole creation and the new wonderful stamps I used for this panel, if visiting the link above . The face stamp and more are from Donna `s new sets, - 4 in all, and all of them equal wonderful, and amazing. I wish you a lovely rest of the week,. friends. all kind of neutrals , : nature ,- creations, and what else you can think of . cotton bird resting inside . The shoes I found on a flea market !! here decorated with an old corsage pinn. Thank you so much my dear Wen, for starting this beautiful party again, I`m sure many have missed it , and am so happy to see you back. and for this weeks Challenge : "Feeling Blue - mainly blue " I enjoyed creating this little panel. I used one of the new paints , Bright Blue , mixed with a bit of white, on the panel, and letting it dry . Then the lovely stencil , Mandala was used together with the Metallic Ice Blue ,paint, dabbed through it, twice , -drying in between each layer. On the other side of panel, I used the tree stencil , first with Potting Soil, and after with Hydrangea, to achieve this dreamy tone. The butterfly from the new Textures Collection set, was stamped directly onto the background, and after also on white card stock. I painted it with a even more soft tone of the blue and white mix. Draw up the lines from the stamp with a grey fine liner, and painted the spots , white , then adhered to the panel on top of the already stamped ,one. The lovely " harlequin "pattern from one of the bigger stencils, I added here and there, also with Hydrangea. boys, from Tim Holz Christmas Paper Dolls, found a place to sit on the lace -holding onto the tree, an d his butterfly in his hand via a silvery thread , from a Christmas gift.He got wings I cut, to suit him,- from a Bits and Pieces Butterflies sheet . They were painted white, and details made with the grey fine liner, -also on his dress I highlighted the details. adhered to panel under the boy. I added white dots , around the perimeter , and made some berries to the tree- and the feelers on the butterfly was also defined more, with a fine liner. http://thatscraftychallenges.blogspot.dk/ for more details . The winner will receive this wonderfulgift , to use in the shop !! Old lace, white card stock scratch, reused silver thread . and here with my , for this year, first blogpost, over at That`s blogging Crafty. and all the best, for this year, to all of you. WISHING YOU ALL A HAPPY AND HEALTHY YEAR AHEAD !! when experiencing , the days just fly off, one after the other. stone wall, it looked amazing. And as we came closer to the town, sun started to go down ,and the light got darker. If you click my photos, you can see more details . by Donna , you can find it if clicking the link . taking care of us, for a healthy and happy 2018 .